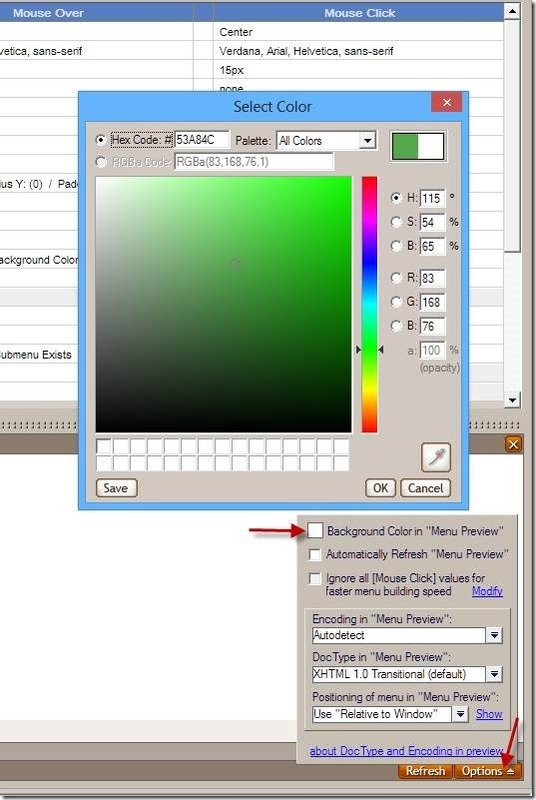 February 9th, 2014AWM: How can I change background color on Menu Preview? Sometimes I have a menu with a colored graphic for the background and white text. In the software, I cannot preview the menu because it's white on white. Wish the software would either honor the background image or else all me to change the color of the preview. Thanks! This already exists in AllWebMenus. In the Preview Pane click on Options and then "Background Color in Menu Preview". Choose the color you wish and click OK, then you will see the preview pane with that background color. unless we use the compatibility button the menu won't show.I have updated the software and tried other suggestions on the knowledge base but to no rewards. It seems that although you compiled your menu with the latest version of AllWebMenus, you forgot to upload the new library files (“awmData-MixMix” folder). Please upload these too in order to fix the problem, and make sure that you upload them each time you compile (especially when compiling with a newer version). December 12th, 2013LWSC: Can Likno Web Scroller have tooltips and open a modal window? Initial Email Subject: Can your web scroller have an image whose link when clicked opens modal window? Considering purchase of your web scroller, client would like to have a modal window open when an image in the scroller is clicked and text in a tooltip (or equivalent text box) open on mouse over. Using the Likno modal windows software so wondered if this behavior was possible with the scroller software from Likno? First, thank you for your interest in our products. Yes, you can have a modal window to open when you click on an image of the scroller. You can also have a tooltip appear when you mouse over the image. Please, download Likno Web Scroller Builder http://www.likno.com/jquery-scroller/download.php and try it so you can see live what you ask for before purchasing.